The newly constructed River Homestead neighborhood is comprised of thirty units ranging between 4 and 6-bedroom duplexes and triplexes – conveniently located across Yellowstone Club Trail from the Camphouse Pool and Fitness Center, overlooking the base area, Pioneer Mountain, and Eglise Mountain. Buildings 13 & 14 are the two Triplex units in the River Homestead development. The units comprising of Buildings 13 & 14, have 4,370 heated livable square feet in units A & C, and 4,597 heated livable square feet in the B units, 5 bedrooms, 5 bathrooms, 2-car garages, an open great room, kitchen, and dining room, and a recreation room. River Homestead’s scenic location with close proximity to the river inspired its design, and natural wood and river stone exteriors distinguish the development while allowing it to complement and augment its beautiful setting. Additionally, the outdoor living spaces that accompany each unit facilitate strong connections to the homes’ natural surroundings. 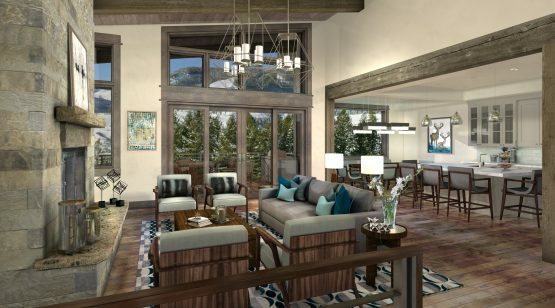 Once inside each unit, expansive floor-to-ceiling units on the main level maintain and strengthen ties to the outdoors and frame expansive mountain and base area panoramas. 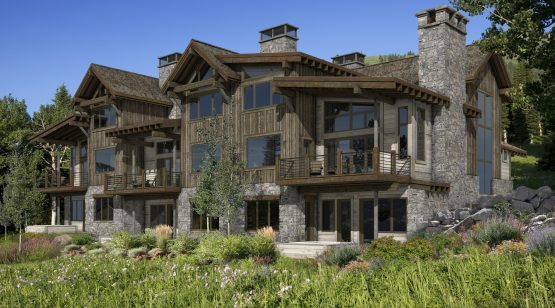 Homeowners will be mere steps from world-class fishing, base area amenities at Warren Miller Lodge, and recreational opportunities on Miller Lake as well as Moose Lake trail, one of the Club’s most scenic hiking areas.